Bonnie Glaser speaks with Taiwan Security Research on Taiwan’s participation in the international community. Ever since the Republic of China lost its seat in the United Nations in 1971, Taiwan has been in a desperate battle to claw back its lost international space. Its situation has worsened over the years as the PRC has grown more powerful and has used its newfound economic and political levers to control or limit Taiwan’s participation in the international community. After nearly two years under new leadership, what do we now know about the PRC’s policy on the issue of Taiwan’s international space? Taiwan Security Research’s Kristian McGuire** speaks with Bonnie Glaser*, a senior adviser for Asia, Freeman Chair in China Studies and a senior associate, Pacific Forum at the Center for Strategic and International Studies and a leading expert on Taiwan’s participation in the international community about this, President Ma Ying-jeou’s bid to meet President Xi Jinping at November’s APEC Economic Leaders’ Meeting in Beijing, and more. Kristian McGuire: Last fall, you published a report on Taiwan’s participation in the international community. At that time, China’s 18th Politburo Standing Committee had only been in office for a year and Xi Jinping had been president for about eight months. Now that we have had a little more time to observe China’s new leadership, how would you describe its position on Taiwan increasing its international space? Bonnie Glaser: I don’t see any radical change in mainland China’s policy on the issue of Taiwan’s international space. I see continuity. Kristian McGuire: So that leads into my next question. In your report, you point out that there are certain international NGOs and IGOs that the PRC has allowed Taiwan to participate in but not join as a permanent member or permanent observer. What incentive is there for Beijing to allow Taiwan permanent membership in any organization? In other words, why would it choose to relinquish any of the leverage that it now holds over Taiwan? Bonnie Glaser: I believe that Beijing has a long-term objective of seeking peaceful reunification with Taiwan. It understands that playing a bigger role in the international community is very important to the people of Taiwan. Many public opinion polls in Taiwan have shown for years that the public in Taiwan highly values participation in the international community and sees this as an issue that’s related to Taiwan’s dignity. So I think that if mainland China ignores this issue, and if it continues to squeeze Taiwan’s international space to keep Taiwan out and prevent the people of Taiwan from participating in addressing important regional and global problems, this will make it more difficult for China to eventually achieve any accommodation with the people of Taiwan. 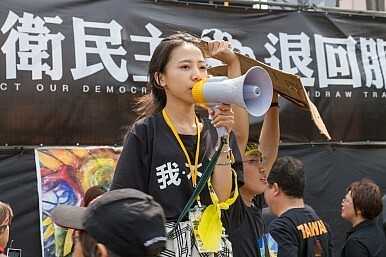 Polls show that a majority of people in Taiwan still see the mainland as quite hostile to Taiwan – sometimes to the government, sometimes to the Taiwan people. So I think that when China allows Taiwan to participate in some capacity in an organization it is because it has relative confidence that this participation can be controlled. Mainland China remains fearful that Taiwan might use some status in an international organization as a platform to promote de jure independence if there were to come to power a person in Taiwan who sought to achieve independence from the mainland. That happened, from the mainland’s perspective, when Chen Shui-bian was president and they are fearful that it could happen again. But when there is a great deal of pressure from Taiwan, or from the international community to allow Taiwan to participate, then sometimes the mainland finds an opportunity to allow that. The charter of the particular organization Taiwan wants to be part of must allow for non-sovereign entities, and that’s a big problem with U.N.-affiliated organizations because there are very few of them that have charters that allow for even observership of a non-sovereign entity. But compromises have been found in the case of the World Health Assembly, the executive arm of the WHO, and more recently with the International Civil Aviation Organization (ICAO), but Taiwan does not have observership in ICAO. In 2014, it attended as a special guest of the president of ICAO. It remains to be seen whether Taiwan will be allowed to participate in any of the organization’s technical meetings. So I think very little progress has been made, and the mainland has been very careful and cautious, but does allow Taiwan some participation in order, I think, to win over the support of the people in Taiwan. Kristian McGuire: If the follow-on agreements to ECFA are not ratified, how might Taiwan proceed with expanding its international space? It seems like ECFA, or at least the follow-on agreements, have become sort of a barrier to further progress. Bonnie Glaser: Well, the mainland has not said very explicitly that there are preconditions to allowing Taiwan to expand its international economic space – that is, to participate in the regional economic integration process. But it does appear from conversations that have taken place, some that I have had myself, with mainland officials that there is some linkage between completing ECFA and having Taiwan participate in the regional economic integration process – this includes RCEP, it may include TPP – which if China opposed, would make it more difficult for Taiwan to join. But if China is not a member then it will have less leverage in opposing Taiwan’s participation from the outside than it would have from the inside. But then there is also the issue of bilateral free trade-type agreements that Taiwan might be negotiating with other countries. We have seen successes with Singapore and with New Zealand. And it appears to me that the mainland is now blocking the completion of new bilateral free trade-type agreements between Taiwan and other countries. For example, there was recently a statement made by China’s ambassador to Malaysia suggesting that China would oppose a similar agreement between Taiwan and Malaysia which I think would be very unfortunate. So if ECFA does proceed, if the Trade in Services Agreement is ultimately ratified, if the Merchandise Trade Agreement is completed and ratified, I think Taiwan will face fewer problems, less opposition from the mainland. But if those agreements do not move forward, then the questions will arise: To what extent will the mainland block Taiwan’s participation? How explicitly? And then will Taiwan seek to find ways to try and make some progress in these agreements? And will it be able to do so? Those are questions that will have to be dealt with down the road if those circumstances arise. Kristian McGuire: President Ma has been pushing for a meeting with Xi Jinping at the November APEC summit in Beijing. Would such a meeting have any effect on Taiwan’s international space, or is it more about helping Ma domestically? Bonnie Glaser: I think that if President Ma were able to attend an APEC meeting, it would be a major breakthrough for Taiwan and for President Ma’s administration. Taiwan is a member of APEC as an economy but it has never been allowed to send its president, so the president always chooses his special envoy to attend on his behalf. Once a representative from Taiwan is at the APEC meeting, that individual has had the opportunity to interact with other representatives from other countries including some leaders, and including some leaders from leading countries such as the United States. So I think that Beijing is quite worried that if President Ma were to go to such a meeting that he would have bilateral side-meetings on the margins of the major APEC meeting, the APEC Leaders’ Meeting. That would boost the perception that Taiwan is an independent, sovereign entity. That is something that Beijing very much opposes and worries about. So I think from the outset, Beijing has made clear it would like to have a meeting between the leaders on the two sides of the Strait. This is actually not a new position. It’s something China’s put forward some time ago, but it will not do so, so Beijing has said, at APEC. It will not permit Ma Ying-jeou to come. But I think that there is still some hope in Beijing that, during Ma Ying-jeou’s time in office, a meeting can be arranged someplace else. Now of course President Ma believes that APEC is the right place for him to meet with Xi Jinping. And whether there might be some circumstances in which that could be worked out – I personally think it doesn’t look like that’s going to happen. But Taiwan has not given up. And so I guess we’ll have to see. But there is a desire on the part of the leaders on both sides of the Strait to meet. I would ask the question: Why? What do they hope to achieve? What would be the objective? What could be accomplished in such a meeting? I think those are questions that should be addressed. Kristian McGuire: How might Taiwan reassure Beijing that its quest to increase its international space isn’t, in fact, the kind of “creeping independence” Beijing so often accused Chen Shui-bian of pursuing? Bonnie Glaser: The reason why it’s quite difficult for Taiwan to reassure Beijing is because Taiwan is a democracy; and what one leader says he will do today does not tie the hands of a future leader who might come to power in Taiwan. Having said that, China is increasingly powerful in the world in economic terms first and foremost, but also militarily and politically. Most countries in the world value China’s concerns, its interests and opinions, and very few will stand up to China and take steps that would truly be harmful to China’s interests. I think that Chinese concerns about Taiwan’s “creeping independence” are unnecessary. They were valid at a time when China was a much weaker state. I think that they are really no longer valid today. I think there is no way, even if Taiwan participated in almost all of the major UN-affiliated IGOs, for example, that it could use that as a platform to somehow achieve recognition as an independent nation. So Beijing should be more confident and not oppose Taiwan’s participation in international organizations due to fear that Taiwan could use these as a platform to promote independence. Kristian McGuire: In your report, you make several policy recommendations for Taiwan, China, and the United States. Are there any recommendations that you would make to other countries to help Taiwan participate more fully in the international community? Bonnie Glaser: Well the audience of my report was primarily the United States, mainland China and Taiwan, but I think I even did include some mention of other countries. It’s important for other countries in the world to proactively support Taiwan’s participation. They can do that in their legislatures and they can also do that through government representation. I believe that there were other governments who were members of the World Health Organization or the ICAO who supported Taiwan having greater participation and greater status in those organizations. I think it’s helpful if other countries in the world also stand up for Taiwan’s right to participate. They can talk to Beijing. They can urge China to be a little bit more open-minded. But at the end of the day, this is something that, if Taiwan cannot win support from the mainland, the mainland can block Taiwan. And so there is a role for the United States, and for other countries, and Taiwan, and for the mainland. Everybody has to do their part. Kristian McGuire: Lastly, our readers would be interested in hearing about any projects you or your colleagues at the CSIS are working on related to Taiwan. Bonnie Glaser: I’m personally doing work on Chinese foreign policy, trying to understand what has changed under Xi Jinping. What are the continuities and discontinuities in comparison to Chinese foreign policy during Hu Jintao’s era. I’m doing a great deal of work on China’s relations with its neighbors and particularly with a focus on maritime issues, the East China Sea and the South China Sea, and the developments in those regions and among the claimants. I am doing another project that is related to Taiwan’s international space which focuses on Taiwan’s role in security-related organizations that looks at Taiwan’s potential contribution to multilateral organizations that deal with counterterrorism, law enforcement, humanitarian assistance and disaster relief, and nuclear proliferation. And I will be publishing another report on this topic later this year or early next year. Kristian McGuire: Alright, thank you very much for your time. * Bonnie Glaser is a senior adviser for Asia in the Freeman Chair in China Studies, where she works on issues related to Chinese foreign and security policy. She is concomitantly a senior associate with CSIS Pacific Forum and a consultant for the U.S. government on East Asia. From 2003 to mid-2008, Ms. Glaser was a senior associate in the CSIS International Security Program. Prior to joining CSIS, she served as a consultant for various U.S. government offices, including the Departments of Defense and State. Ms. Glaser has written extensively on Chinese threat perceptions and views of the strategic environment, China’s foreign policy, Sino-U.S. relations, U.S.-China military ties, cross-strait relations, Chinese assessments of the Korean peninsula, and Chinese perspectives on missile defense and multilateral security in Asia. Her writings have been published in the Washington Quarterly, China Quarterly, Asian Survey, International Security, Problems of Communism, Contemporary Southeast Asia, American Foreign Policy Interests, Far Eastern Economic Review, Korean Journal of Defense Analysis, New York Times, and International Herald Tribune, as well as various edited volumes on Asian security. Ms. Glaser is a regular contributor to the Pacific Forum quarterly Web journal Comparative Connections. She is currently a board member of the U.S. Committee of the Council for Security Cooperation in the Asia Pacific, a member of the Council on Foreign Relations, a member of the International Institute of Strategic Studies, and she served as a member of the Defense Department’s Defense Policy Board China Panel in 1997. Ms. Glaser received her B.A. in political science from Boston University and her M.A. with concentrations in international economics and Chinese studies from the Johns Hopkins School of Advanced International Studies. This article was first published in Taiwan Security Research. It is republished with kind permission. Who Is 'Mr.' Xi Jinping? If Xi had used an official title in his meeting with Taiwan's leader, what title would he have chosen?